Bachelor of Arts student, Chris Lawless, is currently completing a double degree in Anthropology and Philosophy. Chris presented his abstract at the Conference on Thursday 18 August and won over the judging committee with his research project and abstract entitled ‘Governmentality, Labelling Theory and the conflict of identity and meaning in mental illness: an autoethnographic account of becoming and unbecoming bipolar’. Chris’ research is developed from his personal experience of being misdiagnosed as having bipolar affective disorder. 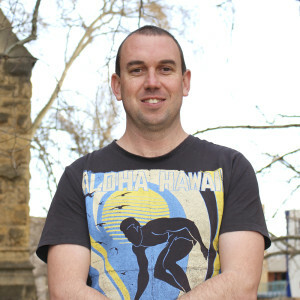 His research aims to highlight how the way in which patients are currently labelled and governed by systems of authority can have a direct impact on patients’ mental health: that the conflict of being misdiagnosed (even correctly diagnosed) may hinder a patient’s understanding of the situation and may make their illness worse. Chris strongly encourages other students to enter their research into the Conference. Chris says it was a great opportunity to challenge himself, after all, that’s why he came to university – to get out of his comfort zone. Chris will now go on to represent the Faculty and the University at the Australasian Conference of Undergraduate Research in October in Queensland. This entry was posted in Awards & Achievements, News, Research and tagged Anthropology & Development Studies, Humanities, Philosophy, Social Sciences. Bookmark the permalink.